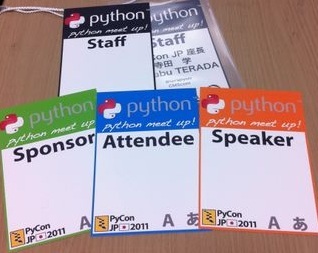 The Japanese Python community is proud to present the second semi-annual PyCon JP in Tokyo Japan. PyCon provides a chance to join and communicate with users or developers using Python. PyCon JP is intended as a gathering for the Python community to inform and transmit ideas about the use and growth of the Python language. The Japanese Python community held our first PyCon JP, "PyCon mini JP" (Japanese) in January 2011 to help grow community leaders and test the need for a Python conference in Japan. Due to the overwhelmingly positive response and success of the event, we have decided to continue with a semi annual PyCon JP conference. For participants coming from outside of Japan: Payment is available via PayPal. Please go to the PayPal section below and follow the instructions, then fill the form in section 2. Do not forget to provide your transaction ID in the "Serial No." field. Party will be held after PyCon JP conference has been closed. We expect to meet up to you. Sprints submission is open to everybody, by using PyCon JP 2011 Sprint Spreadsheet. Please submit a sprint only if you really intend to hold it and help out other people joining it. Meet talented Python users at Office Hour -- the schedule is shown here . And great surprize, Guido will join as special guest! Please come to OH booth at 3F hallway. Reception is at 3F. For smooth registration, use stairs instead of elevators. Eplus users: show your ticket printed by eplus. PayPal users: show your transaction email (printed or displayed). Invited guest (without ticket): Consult to reception staff. Note that visitors without ticket may be rejected. Make sure to receive your ID tag. Always show your ID tag at conference rooms and hallway. Participant without ID may be asked to exit. Transferring/lending of ID is prohibited. Feel free to enter/leave venue at any time. You can tell your speaking-or-try-to-speak language by marking "A" (english) or 「あ」 on your ID. Stamps are available at reception. We will take pictures/movies, including presentations and participants. They may be published on blogs, reports and magazine articles. Feel free to take pictures/movies, except for designated presentations. WiFi will be available. SSID/Key will be announced at the site. (Sponsored) lunchbox will be available for all participants. Taking foods/beverages is allowed, but have them only at designated area (2F/lunch hall). Not allowed except in the designated area. PyCon JP 2011 is dedicated to providing a harassment-free conference experience for everyone, regardless of gender, sexual orientation, disability, physical appearance, race, religion, or width of indentation. We do not tolerate harassment of conference participants in any form. If a participant engages in harassing behavior, the conference organizers may take any action they deem appropriate, including warning the offender or expulsion from the conference with no refund. If you are being harassed, notice that someone else is being harassed, or have any other concerns, please contact a member of conference staff (identified by black badge with "Staff" label) immediately. This policy is licensed under the Creative Commons Zero license. This policy is based on several other policies, including the Ohio LinuxFest anti-harassment policy.